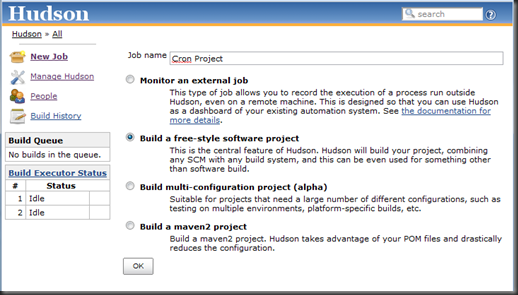 In this post, I will explore installing and configuring Hudson as a continuous integration server for .NET projects. Why Hudson? This is good question. I know other CI servers exist, however, Hudson happens to already be an accepted solution at work. 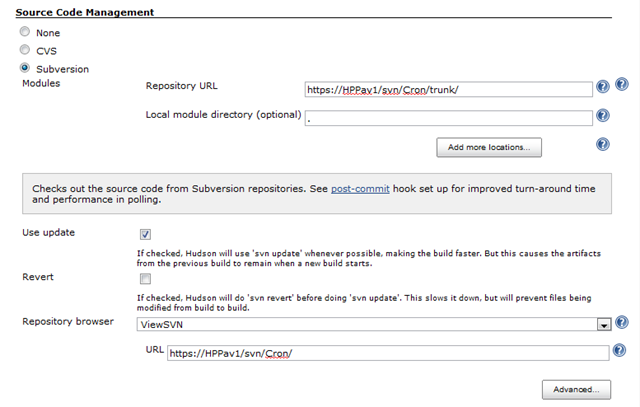 Hudson is a web application that allows you to monitor your build process. Hudson is extendable via plug-ins. For more information about Hudson visit their website. For the purposes of this tutorial, I am unpacking the Hudson war file to the ‘c:Hudson’ folder. When configuring Hudson keep in mind that it will need disk space to pull code from source control, perform builds, and maintain a workspace. The folder selected should have the capacity required and some thought should be put into your backup strategy. You probably don’t want to run Hudson via the command line in your production environment. 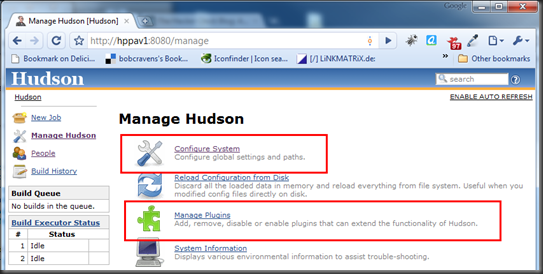 To install Hudson as a Windows service use the “Install as Windows Service” option on the “Manage Hudson” page and follow the instructions. Now you should have Hudson listed as a Service in your service panel. Configuration of Hudson is done using the “Manage Plugins” and “Configure System” options on the Manage Hudson page. First visit the “Manage Plugins” option and click on the “Available” tab to display a list of plug-ins that can be installed. Again, Hudson is “internet aware” and will fetch these from the interwebs so a network connection is required. There are an ever growing number of plug-ins as the Hudson eco-system continues to evolve. Explore the list, and search the internet for possible extensions. I will focus on plug-ins to get .NET projects into the Hudson CI environment. MSBuild Plugin – This plugin allows you to use MDBuild to build .NET projects. MSTest Plugin – This plugin converts MSTest TRX file metadata into a format that it can be integrated into the Hudson’s JUnit features. This will make the test reports available as build output. I am using Subversion for source control. Hudson has built in support for Subversion. Other source control libraries may require a plugin to be selected to access your code. These are the bare minimum to get your .NET projects built and automated tests run using Hudson. After the install, be sure to restart your Hudson service. Notice that you can have multiple MSBuild configurations. This might be handy for building projects using the different versions of the .NET Framework. 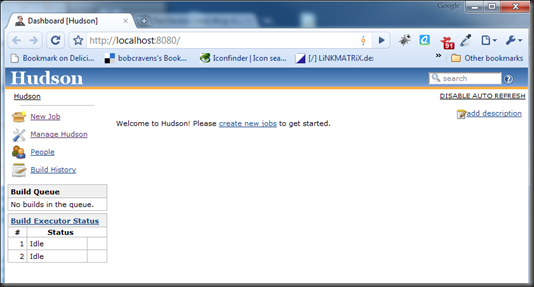 Build jobs are added via the “New Job” option on the Hudson main page. Select a name and the “Build a free-style software project” option as shown below. Then click “OK”. Now a ‘job’ will appear in the main Hudson page. Click the ‘Configure’ link in the list on the left. First select the “Discard Old Builds” option and configure the policy for limiting disk consumption. Notice the period in the “Local module directory (optional)” field. That will force Hudson to check out the project directly into the workspace rather than into a subdirectory. To setup the build select the “Add a Visual Studio project of solution using MSBuild” option from the “Add build step” drop down list. This will take the ‘trx’ test results metadata file (XML), transform it into HTML and make it available as part of the build output. 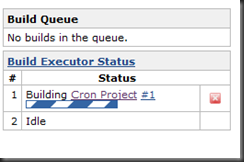 Click “Save” at the bottom and the project should be ready to build manually. I found that I need to restart Hudson for the configuration to take effect. On the main Hudson page you will see a list of all the jobs. On the right-hand side there is a button that allows you to schedule a job. 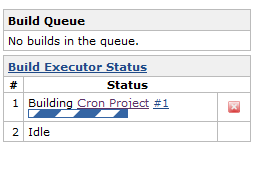 Clicking that button will start the build process. This build happened to fail. 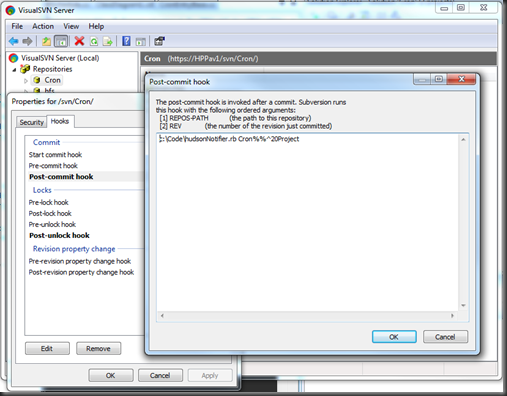 To determine the cause of the failure take a look at the “Console Output” using the link on the left hand side. In my case I see the following. The job failed again, because 3 tests failed. This is exactly what we want. If the source code doesn’t build, the job fails and if any test doesn’t pass the job fails. Hudson provides a wealth of information. The “Console Output” window shows the commands that were issued by Hudson and the results. So I see the Hudson checking out my code from subversion…. …finally you can see the results of the tests. As indicated above I have 3 tests that failed and the job fails as a result. On the build status page, there is also a link to a “Test Result” report that provides a list of failed tests and links to more details. From here you can dig right down to the stack trace information for the failed tests. where YOURHOST is your server / port and PROJECTNAME is the project name. You can get these parameters by looking at the URL in Hudson when your project is selected. This knowledge is key to having the source control system trigger Hudson to build a project. Having Hudson perform builds based upon changes in the source code, requires that we install a post commit hook into the source control repository (Subversion) in my case. This will vary depending upon your source control system. 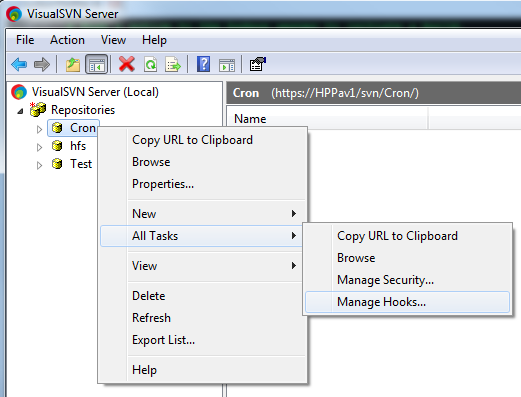 For VisualSVN, I add a hook by right clicking on the repository and selecting the “All Tasks” – “Manage Hooks…” option. I then configure a post commit hook to execute a Ruby script. Notice in the above configuration the escape sequence for the percent sign. This took me hours to figure out. Please learn from my blood, sweat and tears. 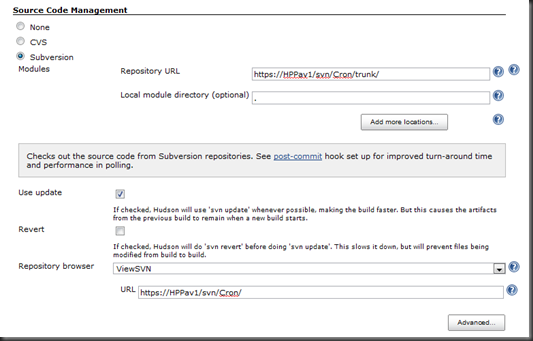 # Push a notice to the hudson server to initiate a build. Now whenever code is checked in, Hudson will be triggered to build and run the tests for the project. 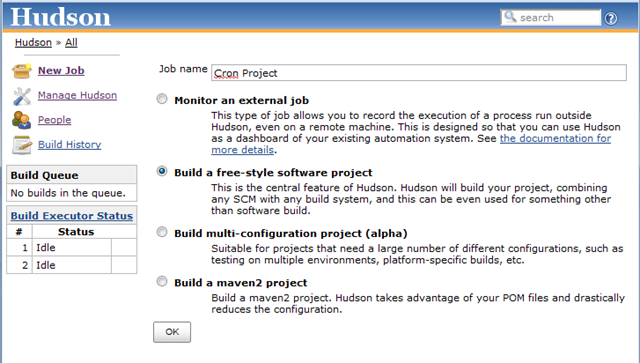 Now we have Hudson configured to kick off a build whenever changes are committed to source control. Hudson has many other features worth exploring. For instance, the next step may be to setup email or IM notification of build results. Glad you liked the post. We are mostly a Java shop at work, but use Hudson for build system. I would consider myself a Hudson noobie. So far, I have found it to be quite easy to set up. I intend on exploring a bit what it offers to .NET developers. As you have enumerated on your site, there are quite a few plugins for Hudson. I do intend on exploring these a bit and I may post again on Hudson. Please feel free to contact me at bob DOT cravens AT gmail DOT com. Very nice post. I have been using Hudson for Java builds for the last few years. It really is a good CI tool. Thanks for the post though. I didn’t know if anyone was using Hudson for .NET. I did try to configure Hudson to poll SVN for changes. I could not getting it so that it only did a build when there were actual changes. Maybe a communication issue between Hudson and VisualSVN…or maybe a configuration issue by me. In either case, the build was occurring at the interval that I specified even if no changes were present. I decided to leverage Hudson’s ability to kick off a build via a web request. If anyone has experience setting up Hudson to poll from VisualSVN and only build when changes are present please share. I could not get that working. Nice post. 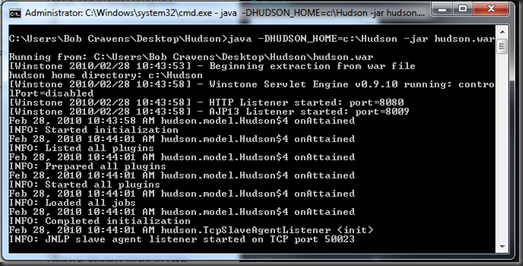 I’ve used Hudson for several years on both Java and .Net projects. I’ve used the NUnit framework (with a nice plug-in) to run the tests. One question, though. Why did you choose to use a post-commit trigger instead of having hudson poll the repository? Not a criticism, just curiousity since we’ve used SVN polling for many years without any problems (just have to adjust the polling interval appropriately). I was not able to get Hudson and VisualSVN to communicate via SVN polling. Hudson always got the "repository is dirty" signal, pulled all the code and kicked off a build job. As a result, I implemented the post-commit trigger. I have recently started using trunksapp.com for my SVN repo. 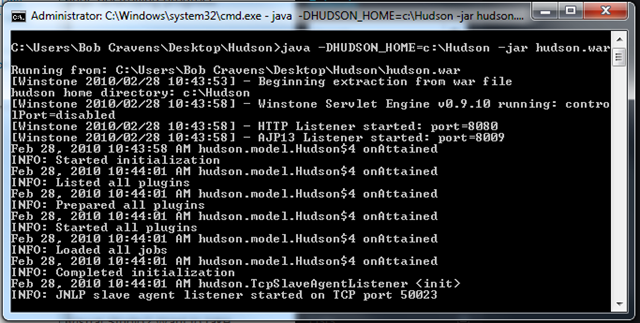 I have not setup Hudson yet, but will try the SVN polling again. The only thing I’ve have done differently and thought is worth mentioning is our builds have an "exit 0" at the end of the test batch job. This means that if the tests fail, the job doesn’t see it as a failure. Hudson then thinks that the job succeeded (the build worked and the test step returns an zero errorcode). It is however clever enough is see that some or all of the tests failed and marks the build as "unstable" (with a yellow ball icon). I prefer this unstable designation and it allows users to easily see if they have broken the build or merely broken the expected functionality. 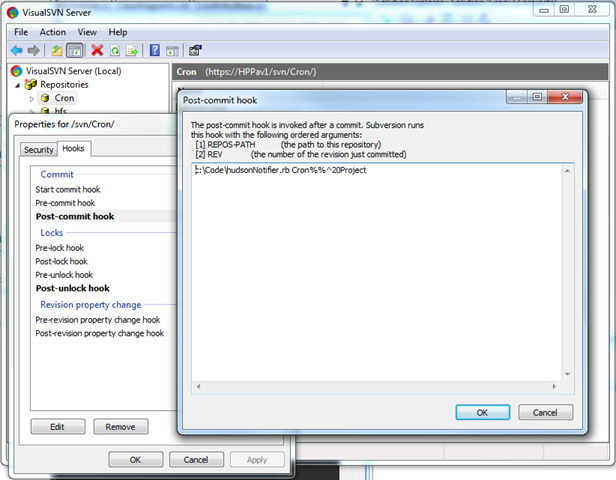 Does hudson supports .NET framework 4 and visual studio 2010. I’m able to build a solution but reports are not getting displayed in the page. The report (unit tests and fxcop) xml files are getting generated. I have not had the opportunity to try Hudson on a .NET 4 project. However, I don’t think that the .NET 4 framework would cause any issues. Hudson is just spawning out to MSBuild. I suspect (from the info that you provided) that the XML format for the reports has changed and the XML to HTML (or other) conversion is broken. You can try getting in touch with the plug-in devs to see if there are issues. I can’t configure gmail with Hudson. Hudson doesn’t send emails to the configured gmail account. What should be added to the hudson.xml? Sorry for the delay. To get Hudson (I am actually running the latest Jenkins build) to send emails on our local exchange server I just entered the SMTP Server address. I have not configured Jenkins to send email via GMail. I found this on Server Fault (http://serverfault.com/questions/144360/sending-email-using-smtp-gmail-from-hudson-ci). Don’t know if that helps. Very nice write-up! Thanks for taking the time to document this and put it online. I found various pieces of information scattered all over the web, but this one is by far the most complete tutorial I found. Just got everything setup and it’s working like a charm. Your article probably saved me a good day of trying to figure it out on my own. Can someone help me in publishing/copying the code to a location? Then I need to move the code to a server for deploying the code. I am able to build the code successfully. 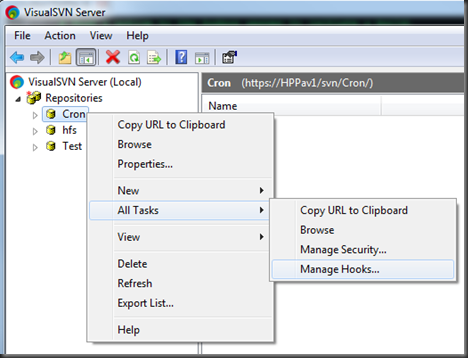 I am working on .Net projects with SVN and Jenkins.